The feast seems to have been introduced at Constantinople a century later, which would be the 8th century, under Patriarch St. Tarasios. According to Vladimir Lossky, it was adopted in the West only in the 14th century, celebrated for the first time in Avignon, where the papacy was in exile under Pope Gregory XI, in 1374. In the West, this festival never seemed to be a major feast as it is in the East where it is considered to be one of the twelve major festivals of the Orthodox Church year. This festival, like that of the Nativity of the Mother of God, and the Conception of the Mother of God, and even the Dormition of the Mother of God, is created, fashioned out of the living tradition of the Church, the living memory of the Church. It is not recorded in Holy Scripture. It’s not found in the Bible. But what we do have is an early document, certainly, scholars claim, not later than the second century, an apocryphal work called the Protoevangelium of James. This work was certainly entitled or attributed to James because James was the first bishop of Jerusalem and considered to be the leader of the Jewish Christian traditions, not the Gentile traditions but the Jewish Christian tradition. Scholars often thought that thisProtoevangelium of James actually emerged out of Jewish circles, whereas other scholars argue that it doesn’t seem so because there’re just too many mistakes in there. There’re too many things that a Jew would haveknown, and so they kind of conclude that the author was probably a Gentile. In any case, it’s really early. It’s in the second century. It’s not canonized by the Church. And it’s the only Christian work… It’s the only work in early Christianity, I should say, whose main character is Mary. There are no other writings which are about Mary as Mary. You have plenty of writings that refer to Mary that are about Jesus, and you have references to Mary very early in the Church as the Mother of God, the Mother of Christ, the Pure Virgin, the New Eve, the living Temple, and so on. You have these, but they’re not centered primarily on Mary. However, this Protoevangelium of James is, and it’s very difficult to say exactly what kind of literature it is. It’s virtually certain that it is not historical literature. It is not about historical facts as such. In fact, it’s probably considered to be that form of writing that was very popular at the time where you made a narration, you made up a story, in order to make points, to make theological and spiritual and even exegetical points. There was certainly that tradition among the Jews. You have Midrashic writings where certain parts of the Scriptures were taken and kind of refashioned, and popular stories were written from them in order to teach the people and to contemplate the truths of the faith. And this seems to be exactly what we have here in the story that emerges historically out of the Protoevangelium of James. Basically, the story is that Joachim and Anna who are childless, they pray to God for a child, they conceive in old age, the child is born, it’s a girl, they know it’s especially holy as a gift of God, they vow to offer the child to the Temple. When the baby is two years old, they consider doing it; they say no, let’s wait another year. When the baby is three years old, they take the baby to the Temple; they offer it to the Temple. Then it says that she lived inside the Temple. It even claims she was taught there by angels. In fact, even a further elaboration of the Protoevangelium even claims that she sat within the Holy of Holies in the Temple. That is, by the way, not in the Protoevangelium as such, but what is there is that she is kind of raised among the girls who were being raised in holiness in the circle of the Jerusalem Temple. But then, when she reaches puberty and she’s at [an] age when she can bear a child and therefore becomes unclean according to Jewish tradition because of her menstruation, then she is taken outside the Temple area and she’s together with those women who are making the vesting and the coverings for the Temple, the veil of the Temple. Very often on [the icon of] the Annunciation, Mary is shown weaving [for] what was considered to be later the very Temple that was rent in twain when Christ was risen from the dead. But then Joseph is prevailed upon to take her. He already has his children. He’s very old. The testing is made to make sure that she’s a virgin and then Joseph takes her and then, of course, we enter into what we have witness to in Holy Scripture, namely, that she becomes the Mother of Christ by the indwelling of the Holy Spirit, without the seed of man, and there is a virginal conception. Here, I think, speaking the truth in love and being very forthright about it, I have to just honestly say to all the listeners: I really don’t think that what is said in the Protoevangelium of James is literal history. 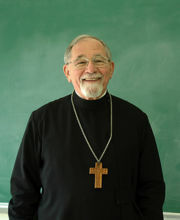 I think it is a theological, poetical, mystical, liturgical contemplation that lived within the living, oral tradition of the Church, and by the sixth century was put together into a liturgical celebration for the edification of the faithful in order to make very firm, clear and absolutely true doctrinal dogmatic affirmations, teachings. In other words, it’s made to contemplate the truth of the Christian faith. Here we could ask the question: What truth? What is really being celebrated here? What is it? And I would say that if you read the service and if you read the three Old Testamental readings at the Vigil, at Vespers, you read all the canons and pray all the canons and sing all the hymns and hear what is said and listen to the Scripture readings, what is being said here and what is being contemplated in the person of Mary as the central character in the story is that human beings are created by God and redeemed by God in Christ and sanctified by God through Christ by the Holy Spirit to become living temples of God himself. And it seems kind of likely—I can’t prove this in any way, but it seems to me plausible, very plausible that the Protoevangelium of Jameswas written as a kind of parallel to the Letter to the Hebrews that you actually find in canonical Scripture: which is in the Bible. Because in the Letter to the Hebrews you have this teaching there, a very clear teaching, about how Christ, Jesus himself, relates to the Jerusalem Temple, how he is the Great High Priest, how he is the Victim, the Lamb who was slain, that it’s by his blood that we’re taken into the true Temple of God which is above the heavens, into the true Holy of Holies where God himself dwells. And probably—I think it’s probable—that that was all written and especially had to be written for two reasons, at least two reasons. One is: how do Christians who accept Jesus as the Messiah relate to the Jerusalem Temple? How do Christians worship? How does sacrifice take place? How do we enter into the presence of the glory of God? What about the priesthood? How does the priesthood function now that Christ is here and has been crucified and glorified? And the answers to those questions are given in the Letter to the Hebrews, that Christ is the Great High Priest. There’s no more sacrificing of [oxen] and bulls and calves and lambs. He is the Lamb of God. He offers himself. It’s by his blood that we are healed. He takes us into the true sanctuary, to the true Holy of Holies. And in order to enter—and this was already very ancient Christianity; you find it already in Origen in the second century—how even the Temple itself is likened to the stages of the spiritual life. The narthex, the outer court, is kind of the purification, the keeping of the commandments. Then you enter into the inner court which is knowledge and knowledge of Logos, the knowledge of the contemplation of the meaning of creation. Then you enter into the Holy of Holies which is contemplation, theologia. After mystikē theoria, you have mystikē theologia. You enter in from natural contemplation into the contemplation of the transcendent realities and the truths of God which are likened to the inner part of the Temple itself. You have that shown through the person of Christ, our Savior and Lord, in the Letter to the Hebrews, so it is plausible to kind of conclude or at least to propose that the Protoevangelium of James is doing exactly the same thing, but contemplating it in terms of Mary, not in terms of Jesus, but in terms of Mary, which is to say: how do the Christians relate to the Temple? How do the Christians, in the person of Mary—because Mary’s the quintessential Christian; she’s like the paradigmatic believer; she’s sort of like the prototype of all believers, of all Christians, and then, of course, Christians being as all human beings ought to be—how does all that relate to us? You might put it that way. The Letter to the Hebrews tells how it relates to us through Jesus, but when you contemplate Mary, that means you’re directly contemplating: what is it that we are called to, and what particularly is Mary in the wholeoikonomia, the whole dispensation of salvation? In other words, what isher place, and then, by extension, what is our place? How do we also live by faith and grace? Now, of course, very important: none of us is the Theotokos! None of us is the Mother of God incarnate. None of us is the Virgin Mary. That’s for sure! She alone has that great honor and dignity and ministry and calling, to be the Mother of Christ, the very Theotokos, the Mother of Godin human flesh. So in this festival, we contemplate her, specifically, particularly, in what she herself is and cannot be denied. And then we also contemplate, by extension, what we believe should also be our situation. In other words, what should happen to us? What has happened to us in Christ? It’s interesting here, of course, that the Temple is the main instrument in this story, because if the Letter to the Hebrews in the Bible is about how Jesus relates to the Temple, then you could say the main point in theProtoevangelium of James is how Mary relates to the Temple, and therefore how we also ought to relate to the Temple. Do you not know that your bodies are members of Christ? Therefore shall I take the members of Christ and make them members of a prostitute? Never! Do you not know that he who joins himself to a prostitute becomes one body with her? For as it is written: the two shall become one flesh. But he who is united to the Lord becomes one spirit with him. Shun immorality. Every other sin which a man commits is outside the body, but the immoral man sins against his own body. Do you not know that your body is a temple of the Holy Spirit within you, which you have from God? You are not your own; you were bought with a price. So glorify God in your body. In the Gospel according to St. John, Jesus even says that those who believe in him and who receive the gift of [the] Holy Spirit from him, he says, “I and my Father will come to that person and we will make that person our temple. We will dwell in that person.” The dwelling place of God will be the human being. And we know that St. Stephen was killed, the first martyr of Christianity, in the Book of Acts, was killed for this teaching, that God who created heaven and earth doesn’t live in temples made by human hands. He says the whole cosmos, the whole galaxies—everything is his temple, but particularly the human being becomes his temple. 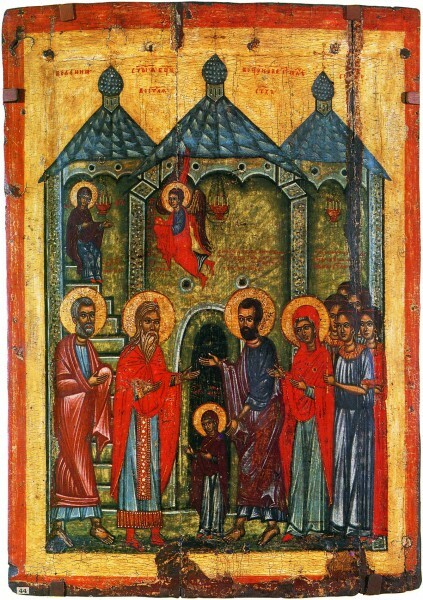 So what we’re celebrating on the Presentation of, or the Entrance of Mary the Theotokos into the Temple is, in a sense, the fulfillment of the physical Temple and its ending. It’s now over, and, of course, the other reason why you have to have the Letter to the Hebrews in the Bible and, most likely, why the early Christians would certainly come up with something like the Protoevangelium of James is because, by that time, it was written: there was no more Temple. The physical Temple in Jerusalem had been destroyed. Of course, it was even one of the teachings of a kind of a mystical Judaism at the time of Jesus that when the Messiah would appear, the first thing he would do would be to destroy the physical Temple, because human beings would become his physical temple. That’s what the prophets predicted, that God would dwell in us, with us, through us. We would be filled with the very presence of God himself. In the Christian faith, that’s Mary. That’s Mary. She’s the quintessential one because God-made-man, the incarnate Logos, Word, and Son of God dwelt in Mary not just spiritually but physically. He really became flesh from her flesh. She really was a temple of the living God because he really dwelt in her. He was born from her. She became that gate facing the east as Ezekiel says, through which the kabod Yahweh, theshekhinah, the indwelling, dwells and it’s sealed. It never, no one else ever passes that way. She is that one. This is what is celebrated and sung about over and over again on the 21st of November/4th December, on this feast of the entrance of Mary to the Temple. So on that day you have three readings from the Old Testament, all of which have to do with the Old Testament Tabernacle and the Old Testament Temple, the Skēnē, the Tabernacle. You have the reading from the Old Testament on the entrance of Mary from Exodus, about Moses and the Ark of the Testimony and the veil and the table and the Temple and the candlesticks and the lamps and the tent of the meeting and the glory of the Lord filling the Temple. You have a reading from the third book of [Kingdoms]—in the Revised or King James Version, it would be I Kings, actually, because of the different titles in the Septuagint as opposed to the Masoretic Bible—but you have about Solomon, building the Temple, the house of the Lord, where they brought the Ark of the Covenant, the holy place with the cherubim and the seraphim and the tables and all the things that go on it. And here, Mary is the one that’s filled with this glory. She is the mercy-seat. She is the ark of the manna. She is the one where the Law is dwelling, and so on. And then you have the Ezekiel prophecy, about the gate facing the east and the glory of the Lord enters the gate of the Jerusalem Temple and dwells within it and no one else enters that way and the glory of the Lord fills the Temple. Today God who rests upon the spiritual thrones has readied for himself a holy throne upon the earth. He who made firm the heavens in his wisdom has prepared a living heaven in his love for man. For from a barren root, he has made a life-giving branch spring up for us, even his mother. God of wonders, hope of the hopeless, glory to thee, O Lord! Today, this day, is the day of the Lord. Rejoice, people, for lo, the bridal chamber of the Light, the book of the Word of Life, the Temple of the living God, has come forth from the womb, and the gate facing east, newly born, awaits the entrance of the great High Priest. She alone brings into the world the one and only Christ for the salvation of our souls. So you have these songs and the canon hymns, all comparing Mary to the Temple: purified, and the issue of purification is there. The holiness: not unchaste, not unholy, not prostituted in any way, completely and totally pure. And this is what is sung on this day, that the bridal chamber of the King, the living Ark, the holy Temple, that she is the one, in Christianity, this is Christ’s own Mother, Mary. It’s not a building; it’s a person. And then, by the grace of God, and by the same faith that Mary had, we also are called to be temples of the living God. We are also called to enter into the Holy of Holies, not made by hands. We are called to be fed by angels the bread of life. All of this is given to us. Today is the prelude, the prelude of the goodwill, the evdokia of God, of God’s godly favor, of the proclamation, the preaching of the salvation of humanity. The Virgin appears in the Temple of God in anticipation, proclaiming Christ to all. Let us rejoice and sing to her: Rejoice, O fulfillment of the Creator’s oikonomia, dispensation. So it’s the prelude of the goodness. And then it says it’s the preaching. It’s the kērygma. It’s the proclamation of the salvation of humanity, of mankind. 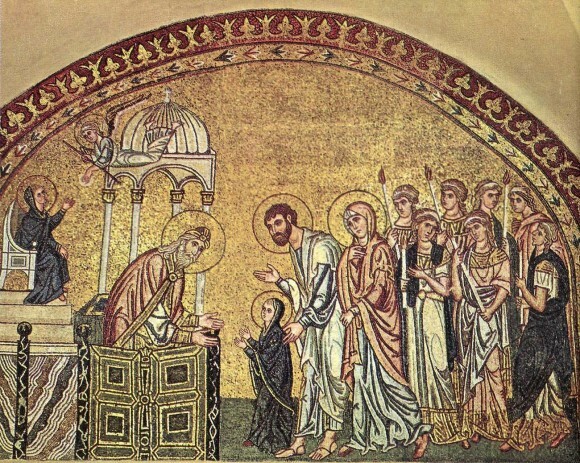 The Virgin appears in the Temple. Now we don’t know historically what happened, but certainly that appearance of the Virgin in the Jerusalem Temple tells us everything. It tells us that it’s all fulfilled and that it’s all over as far as physical temples go. And in anticipation, it says, already as a little girl, you can contemplate the three-year-old Mary and you could know already Christ himself. In anticipation, proclaiming Christ to everyone. You see that little Mary and you see Christ, her Son, and you know what’s going to happen; you know the whole Gospel. “Let us rejoice and sing to her: Rejoice!” Or “Hail!” It’s what the angel says to her, “O fulfillment of the Creator’s dispensation, oikonomia.” Dispensation: the plan of God, the household plan of God. Mary is called the fulfillment, the fulfiller of it, because through her, Christ comes. Through her, God is with us. Through her, the Word becomes flesh. Through her, the Son of God becomes the Son of Man. That’s what is celebrated. The most pure Temple of the Savior, the precious chamber and Virgin, the sacred treasure of the glory of God is presented today to the house of the Lord. She brings with her the grace of the Spirit which the angels of God do praise, saying: Truly, this woman is the abode of heaven. Heaven dwells in her, in this woman. She’s kecharitomenē; she’s full of grace, the grace of the Holy Spirit. The Holy Spirit is upon her. She enters the house of the Lord to become the house of the Lord. She enters into the pure Temple to become herself the pure Temple. She enters where the glory of God, the kabod Yahweh, the doxa Theou, is palpably present, to become herself the dwelling-place of that glory, the sacred treasure of the glory of God. She enters into those holy places to be herself the precious chamber and to be so most pure as a virgin. This is what is sung. Then it says, “The angels behold this entrance and they are amazed.” “How has the Virgin entered into the Holy of Holies?” we sing in church. But actually, it says also, “How has this Virgin become herself the Holy of Holies?” And of course the Holy of Holies that she enters in Christ is the Holy of Holies above the world. That’s why, in the Orthodox Church, it’s said of Mary: she is more honorable than cherubim, beyond compare more glorious than seraphim. That the cherub that stood over the mercy-seat now surrounds her, and that’s why she is shown over the altar tables in classical Orthodox iconography, sitting upon her throne, holding her Child, with the cherubim around her, as the living mercy-seat. As you are a living temple of God, let no impure hand touch you, O Theotokos, but let the lips of all believers sing, constantly magnifying you in joy with the angelic greeting, the angelic salutation: Truly you are above all creatures, O pure one. She is the first of all the creatures—but she’s a creature!—but she’s a pure one, because she’s a living temple of God, and that’s what we are all called to be. Vladimir Lossky, one great Russian Orthodox theologian, he said, following St. Basil the Great, following even St. Ignatius of Antioch in the second century, he said, “There are certain things that belong to thekērygma of the Church.” That means the public proclamation, the preaching of the Gospel, and those are things that you can preach to anyone, anywhere, any time. You can preach it on the street. You can preach it to Jews, to Gentiles, to unbelievers, to cynics, to anybody. You can proclaim Christ crucified and glorified. That’s the preaching. Sometimes it’s called “theologia—theology,” as opposed to “oikonomia.” Oikonomia‘s what you can preach anywhere, any time, any place, to anyone, but the theologia is for those within, those within the holy place, those within the Holy of Holies, those who have become holy by being living temples of God themselves. So what this Professor Lossky wrote, which is important for us to hear right now—he said Mary is not part of the preaching of the Christian faith. We preach Christ, and him crucified. Mary is not part of the Gospel in that sense. In fact, it’s even interesting that in the New Testament, certainly in the epistles, Mary is never mentioned once by name. It’s also very interesting that she’s pretty hidden in the Scriptures. She appears in the Gospels a few places. She’s mentioned at the Cross. She’s mentioned at Cana in John. She comes with the brothers and the sisters in Matthew, Mark, and Luke. She’s present at Pentecost according to the Book of Acts. But then she kind of disappears into the inner life of the Church. And then when you contemplate her, what do you contemplate? Well, as a matter of fact, what you contemplate is exactly what you contemplate and celebrate and experience on this feastday: that she is the living Temple. She is the gate. She is the Book of Life. The Word dwells in her. She is the one who makes the whole thing possible. As I once said in a sermon up at the monastery: “The Gospel is not about Mary, but Mary is definitely about the Gospel.” Because when you contemplate Mary, you contemplate the Gospel. She’s a kind of living Gospel. She’s like a living sermon. She’s like a living icon in her own living life and person of what human life is according to the Christian faith, certainly what Christian life is according to the Scriptures. So this is this marvelous feast of her Entrance into the Temple. Historically, we don’t know exactly what happened, and I have to be really honest; I can’t lie to you: I don’t think, historically, that a three-year-old Mary went into the Holy of Holies. They would’ve killed her. There’s no way they would’ve let that happen. But mystically, theologically, spiritually, that’s exactly what happened. That’s exact Truth! Sometimes, as people say, the historical facts are one thing, and the metaphysical truth is something else! That’s the way it’s given to us. So it would have been… It would be really hard to imagine that by the second century there wouldn’t be this Protoevangelium, kind of a “pre-evangelium” that is contemplated in the person of Mary before Jesus is even born. So you see in her the whole thing. You contemplate the whole reality, kind of, in prefiguration, “in a shadow,” to use the expression of Colossians and the Letter to the Hebrews. You see it all there already, and it’s true, absolutely, completely true and absolutely, completely glorious and marvelous, miraculous, what our Christian faith is. But a person can only know it once they’re within. You can only know it to this depth when you’re no longer standing outside the temple, but when you enter into it. And no longer when you’re looking at the Holy of Holies through a veil, but when you actually enter with Jesus. And when you actually become, yourself, a holy vessel of God. Earthen vessel, to be sure, but still a vessel. Sure, a temple, a house, a tabernacle, a dwelling-place. Then you know these things. We should be very careful not to speak about these things too easily, and certainly never to speak about them to people who are outside [the] Christian faith, because they will just defile it. That’s why the song says, “Let no impure hand touch you, O Theotokos.” We only talk about Theotokos among the believers. Well, of course, as someone once said, “Now it’s too late.” The toothpaste is out of the tube, and everybody knows what we hold about Mary and they discuss it in barrooms and classrooms and everywhere else, where that’s really terrible that that has happened. [It] should never have happened. The people should hear Matthew, Mark, and Luke, then, once they enter, then they would know. I was recently, last summer, actually, I was at a meeting of high school students. They were selected high school students from various churches around the country, and it was at Holy Cross Greek Orthodox Seminary and Hellenic College up at Brookline, Massachusetts. We were… My task up there was to speak to the young people for several days about the heart of the Gospel. What is Christianity? What does itmean to be a human being according to the Christian faith? What does it mean to be co-crucified with Christ? What does it mean to have the Holy Spirit? What does it mean to be a living temple of God? What does it mean to be a stone with other people in a corporate temple of God, as it says in Peter? What are the commandments of God that really give us intimate communion with God when we keep them? What is the purification and the illumination and the deification that we’re supposed to be in a process of completing and perfecting through Christ and the Spirit in the Church? Then we got to speak about—because all the kids who were there were Orthodox, members of the Orthodox Church—we spoke about how Mary exemplifies all of this, and how you see it all in the Church when you come in, and how you experience it in the sacraments and in the services and in all that make up those sacraments and services, like the Scriptures and the songs and the icons and so on. And one young Greek Orthodox woman… I’m not sure if she was a high school senior; there were several young people there who had finished high school. They had been in that program before, and they came back to kind of re-enter and re-contemplate after they had been out. She might have been a freshman in college. She certainly wasn’t 20 years old yet. And in the conversation, she said something that I’ll never forget, how she formulated it, and it applies so much to this festival of the Entrance of the Mother of God to the Temple. The dogmatas, the mysteries—they’re beyond words. You can preach the Gospel of Christ crucified, but to try to give words to the ineffable, the inconceivable, the invisible, the reality that you come to know through the flesh of Christ, through his broken body, through his spilled blood, by the very Spirit of God, you enter into a silence that is beyond words, and when you have that silence beyond words, that’s contemplated within Church services with lots of words! When you’re talking about the ineffable and singing about the ineffable and celebrating the ineffable, you’ve got to use a lot of words, and you say a lot of poetically marvelous things that are way beyond what factical, literal historical events can, in themselves, even testify to. It’s the reality into which they lead you, but then you leave behind what simply belongs to this age, which can be easilyspoken about and communicated. So when you’re on the outside, you can’t understand it, and when you’re on the inside, you can’t explain it. But how do you move from the outside to the inside? The way you move is: you hear the Gospel. You hear the preaching of Matthew, Mark, and Luke. You hear the Passion story. You know about Christ, him crucified, raised, and glorified. Then you hear about what the early Christians did and how they were. And then you come to believe it. And then you come to surrender yourself to it. And then, believing it and surrendering it yourself, you are baptized into it. You die to this life. You are raised with Christ. You are sealed with the Spirit. You enter into the Church. You receive the holy sacraments. You have the broken Body; you have the spilled Blood. And then you can sing, “We have seen the true Light. We have found the true Faith. We have received…” And the Holy Trinity belongs to the inner mystery, too. You can’t preach about the Trinity to people on the street. But once you know Christ crucified, then you know God the Father, and then you know the Holy Spirit, too. And then you live within that Trinitarian, divine reality. So this festival of the Entrance of Mary, the Mother of God, to the Temple, it’s an entrance into the inner mystery. It’s a contemplation, an experience and contemplation of the deepest realities of Christian faith and life. 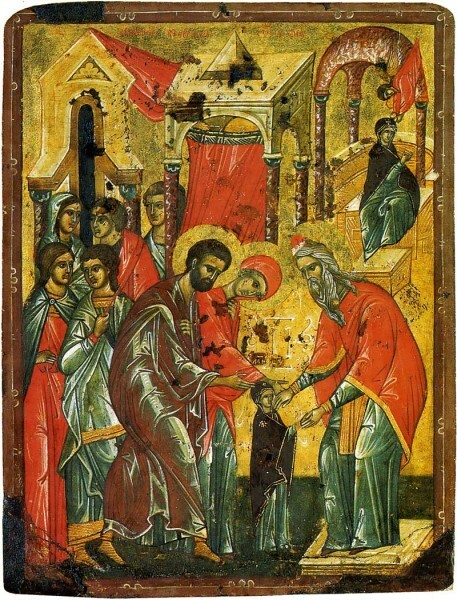 And it’s done by contemplating the three-year-old little Mary, entering into the Temple. And it all opens up, and then you see the whole thing, and it just blows you away! And then you celebrate it and you sing these songs and you knowthat, truly, this woman is the abode of heaven. And so are all of we, if we could believe and be filled with grace like she is. Christ dwells in her; she becomes the living Temple. And so can we be! Christ can be born in us, as the Holy Fathers say. He has to be born in us. He has to be incarnate in our flesh. Our bodies must become members of Christ, as St. Paul said to the Corinthians. And all this is true, and this is what we celebrate on this day. And it’s also a very nice touch that already on this 21st of November, at Matins, when we sing the canon, we sing the odes about Mary entering the Temple, but we also sing the Nativity of Christ’s hymns: “Christ is born! Glorify him! Christ on earth: go to meet him! Christ in heaven: be ye lifted up with him, all the earth, for we have been glorified in him!” So while we’re celebrating the deepest mystery of the Christian faith through that three-year-old little girl entering the Temple, we also sing about how we got there, and how we know all this and how we can see all this in the Spirit. Today is the prelude of the good-will of God, the first preaching of the coming of grace, the Virgin appears in the Temple of God. In anticipation, proclaiming Christ to all. Let us come and sing to her: Rejoice, O abode of heaven. Rejoice, O Temple of the living God who is our Savior, Jesus Christ.